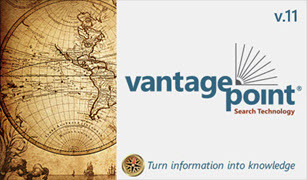 Our flagship product, VantagePoint, is a powerful text-mining tool for discovering knowledge in search results from patent and literature databases. VantagePoint helps you rapidly understand and navigate through large search results, giving you a better perspective—a better vantage point—on your information. The perspective provided by VantagePoint enables you to quickly find WHO, WHAT, WHEN and WHERE, enabling you to clarify relationships and find critical patterns—turning your information into knowledge. VantagePoint Reader is a simplified version of VantagePoint, with which your team can review your results. VantagePoint Academic is licensed annually for academic or research use in universities and non-profit research institutions for activities that result in open publication of research results, contributing to the public research knowledge base (e.g. journal articles and conference papers). VantagePoint Student Edition can analyse up to 5,000 records at a time. VP Student Edition is a one-year license available to students and faculty of accredited academic institutions in Canada, USA, and Europe. It is accompanied by a one-year membership in the VP Institute—a resource for collaboration, training, and tech support. Derwent Data Analyzer (DDA) is a Clarivate Analytics product that is powered by VantagePoint. 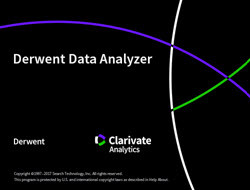 Derwent Data Analyzer has special import filters and reporting macros specifically designed for analyzing patent data and scientific literature from Clarivate Analytics. 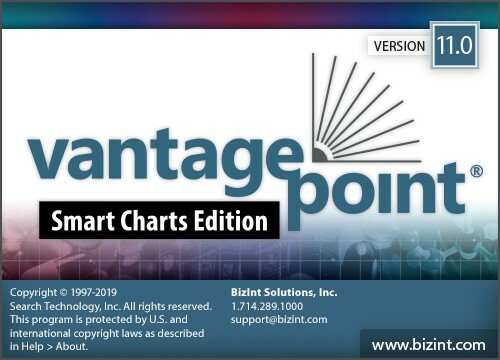 VantagePoint Smart Charts Edition (VP-SCE) is a customized version of VantagePoint, developed jointly by Search Technology and BizInt Solutions for use by BizInt Smart Charts customers. VP-SCE is sold and supported by BizInt Solutions. Please click "More Information" to go to the BizInt Solutions web site.